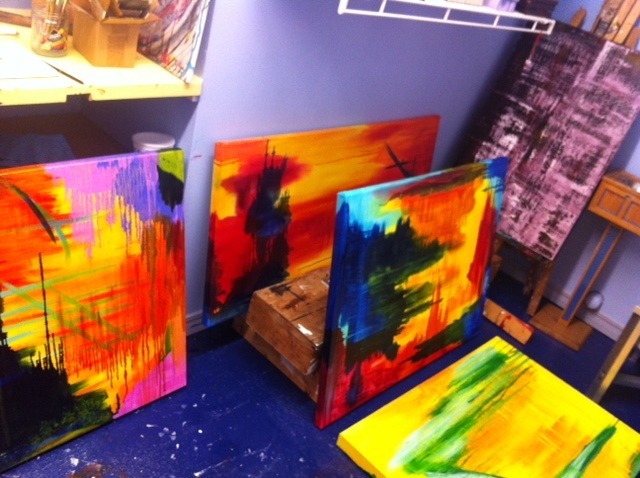 I thought I would share what’s been going on in the studio as I have been working on multiple canvases at the same time. It has been a push and pull experience. We are not finished yet. ‘Texas Translated II ‘ in it’s new home! I thought it would be fun to share the paintings in their new environments, when it is possible to do so. This is one of the ‘Texas Translated’ series from the end of last year. I was fortunate enough to be a guest over the weekend and couldn’t resisit a photograph to share. My Poet’s Commission has left the studio! At my recent exhibition ‘Of Tree’s and Water’ @ The Wine Therapist, here in Dallas, a poet asked if I would paint a commission for him based on some of his published poetry. How could I resist? I will be honest, there were some daunting moments but only due to the fact I was interpreting someone’s heartfelt work and words and wanted to do them justice! Having said that, at times when I felt I was losing the thread , I would re-read the poem I had chosen and the imagery would come again. It ws a new way of working and an engaging process. I am happy to say, the painting was picked up on Saturday and he was very pleased with the result! I’m relieved as it had been painted sight unseen. I had asked to send updates but he was wonderfully trusting and said he was sure it would be perfect! I appreciate his confidence as it enabled me to try a new way of channelling inspiration. Also, I feel quite honored that he asked to use an image of ‘Of Water I’ for the front cover of the next book of published poetry! I hope he enjoys ‘Green Days’ as much as I enjoyed the journey creating it! A big Thank you Mr Poet! I have been having a great time painting the past couple of weeks. It is always refreshing after an exhibition is over and you get to begin a new series. It is also daunting at times…where to start? I have nearly finished a commission I recceived at the last show (‘Of Tree’s and Water’) from a local poet. He gave me his published works and asked me to read them and let the feeling of the words come through as I paint. The result is pleasing. It has taken many a turn along the way but when I felt disconnected I would read another poem and it reignited the thread of what was coming through. Meanwhile, I have been exploring a brighter palette and bolder strokes. It suits the tone of the new year for me. I hope to make a series in the vein of the first painting for the year. It is enegetic and so much fun to paint like that. Wide gestures, sweeping hand movements that use the whole body to come through, it is very much like a dance! Often times painting is as much about when to stop as it is the process of building. With my layering technique I often have many stopping points along the way. There are times I wish I had of stopped when I didn’t but in time these paintings have a lot of depth and are worth the sacrifice of what lies underneath. Here is a photo of the studio last night. The commission is drying on the floor. The rest of the work is still incomplete but all of it is being worked on regularly. 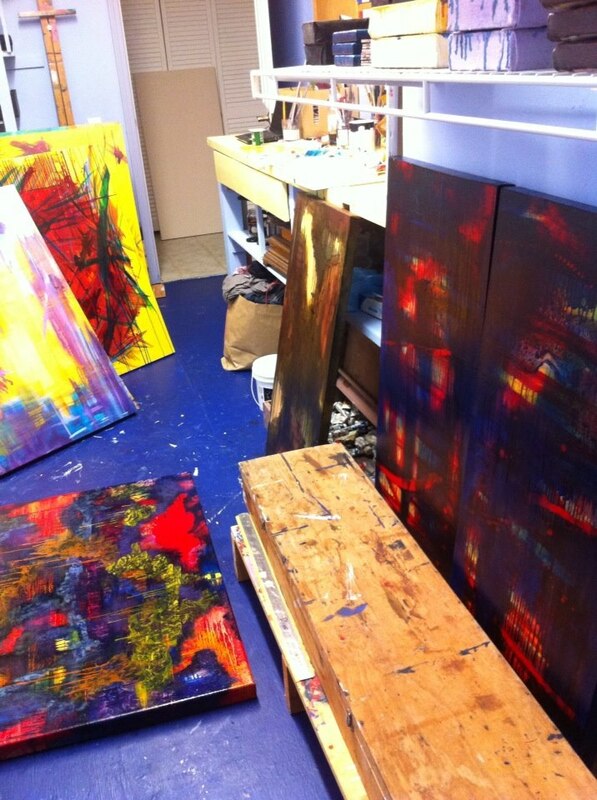 I work on multiple canvases at a time as each layer needs to dry before I can paint another. I paint every day so I need to have a few on the go, it keeps things interesting! A new Palette for a New Year! I have had a lot of fun channelling the New Year energy, using Bright Oranges and Pinks, Zinc White and Turquoise! May this year be full of exciting challenges that help me grow personally and artistically! 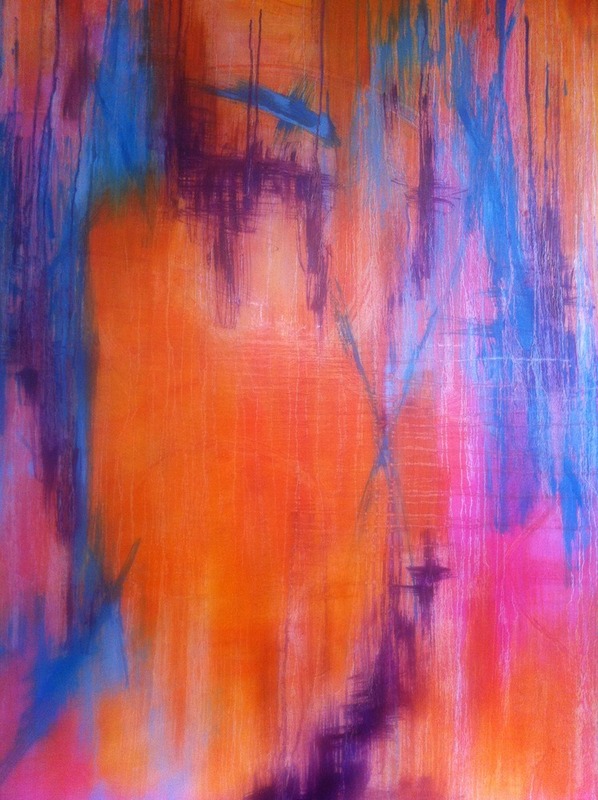 ‘Of Fire I’ has found it’s new home! 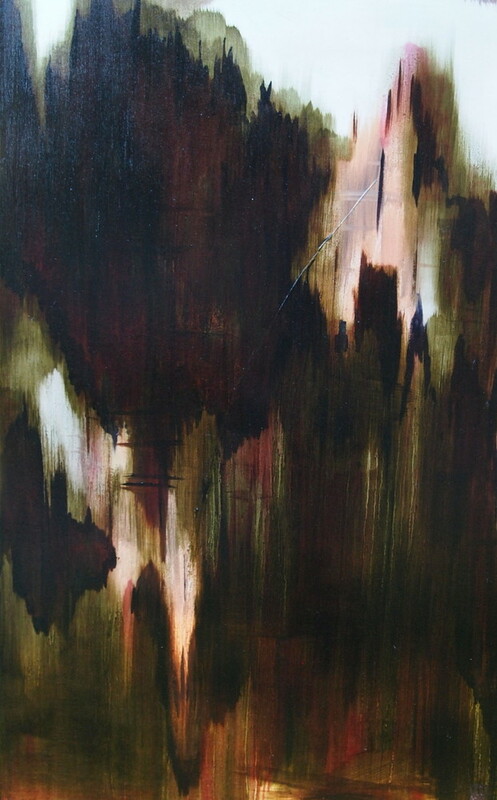 This painting was originally made as a Triptych in ‘The Fire Within’ series. I sold the two end pieces a couple of years back to a family (dear friends) in Canada. I kept this middle painting as I loved it and was not ready to part with it. 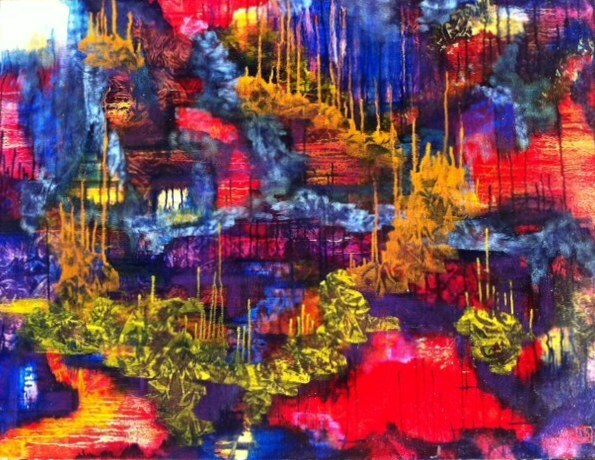 I recently showed ‘Of Fire I’ in the ‘Of Tree’s and Water’ exhibition. I am happy to say, it has found it’s new home with a wonderful family I like very much, so it helps to know I may get to see it again on their wall! There comes a time when a painter must let go of work to make way for the new. There is always new work coming through and it is hard not to get attached to some pieces that become ‘favorites’ but there is only so much wall space and there is something deeply satisfying about selling a painting you want to keep for yourself. I hope the family who bought it enjoys it as much as I have.. Here is a picture of all three pieces hung together. ‘ Of Tree’s I ‘ has found it’s new home! One of my new neighbors has just bought ‘Of Tree’s I’. It is in a spot especially designed for an artwork and properly lit with canned lighting. It can be seen as you descend their staircase and as you walk up the hallway. I think it looks better ‘in situ’ than it did at the show! Perhaps they may take a photo for me to share? I shall ask. I can almost hear the painting say Thank you!